BMW was one of the first automakers to offer curvier, more spacious models of traditional sedans that carried the "Gran Coupe" name. The 4-Series Gran Coupe is a perfect example of what one of BMW's “Gran Coupe” models is, as it's essentially a more stylish version of the 3-Series sedan. Now, BMW has announced that it will be coming out with a 2-Series Gran Coupe. 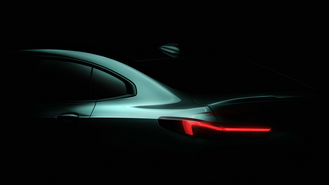 BMW released a single hidden image of the upcoming vehicle and confirmed a reveal at this year's Los Angeles Auto Show, which will be held in November. With the reveal nearly nine months off in the distance, the timing of the news, especially with the New York Auto Show right around the corner, is odd. In a move that will surely draw some ire from purists, the 2-Series Gran Coupe will be front-wheel drive. That's unconventional for BMW, which prides itself on making vehicles that are all about performance. With drive going to the front wheels, the 2-Series Gran Coupe will be the first front-wheel-drive sedan from the automaker in the U.S. While the 2-Series Gran Coupe will fit into the 2-Series family, the vehicle will actually share a platform with the upcoming 1-Series. We're expecting to see that model come out later this year, too. Some consumers may be turned off after hearing that the 2-Series Gran Coupe will come with front-wheel drive, but it's not the only vehicle in BMW's lineup to fall under that umbrella. The X1 sDrive28i and the X2 sDrive28i are both offered with front-wheel drive. The introduction of a Gran Coupe body style for the 2-Series is an interesting proposition, as it will give consumers more variety in BMW's smallest car lineup. At the moment, the 2-Series is only available in coupe and convertible body styles, both of which are only available with rear-wheel drive. With Mercedes-Benz introducing the new A-Class and Audi doing relatively well with the A3, a 2-Series Gran Coupe should do well in the upscale subcompact segment. Only time will tell if BMW's calling card, which has always been driving pleasure first, still translates to the four-door, front-wheel-drive 2-Series.